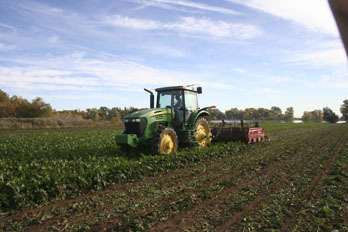 The defoliater works to remove the folage on top of the beets at the Litzenberger's farm in Mead. The cool, crisp mornings may not be everyone’s favorite time of year, but for those who harvest sugar beets, it is perfect. “Cooler weather is best for beet harvest as it tends to increase the sugar content, but a hard freeze can damage the beets,” said Mike Litzenberger, who farms 300 acres of sugar beets near Mead, Colo.
Because farmers are paid on sugar content, not just weight, the time of harvest is crutial. Sugar beet harvest started a few weeks ago, and will run through early November, depending on the weather. Beet farmers use a special piece of equipment to harvest the beets, because they must be dug up from the ground, which if done by hand would take too long. However, before the digger can be used, the plant is defoliated, because the farmers aren’t paid on that part of the plant. The defoliator runs on top of the plant, and slices off the leaves and crown of the plant, which allows the digger to bring up the tuber without worry of binding in the leaves. Once the beats are dug up, they are flipped onto metal rollers, which help clean off any excess dirt. They are pushed to the back of the piece of equipment, where a vertical conveyor lifts them up so they can then be fed into a truck, which drives next to the harvester during digging. The vertical conveyor also helps to shake off any excess dirt. “The less dirt on the beet, the more we can get on the truck,” said Litzenberger. The Litzenberger family is no stranger to harvesting beets. In fact, they have been doing it for generations. “I am a third generation farmer in Weld County. Our family has been in the Mead/Longmont area since the early 1900s. I started with my dad on farming projects in the late 1970s and have been farming ever since,” Litzenberger said. The family plants the beets in mid-April, and use flood irrigation on the row crops. However, the family is very diversified in their production, and also harvests winter wheat, Coors barley, silage and corn grain and hay. “Our crop breakdown is around 300 acres of sugar beets, 400 acres of grain (wheat and barley), 400 acres of corn, and we also have around 200 acres of hay,” he said. The varied times of planting and harvests for this crops keep the family busy nearly year-round. As if the crops weren’t enough to keep the family busy, they also have livestock. “Our family runs about 40 cows, and feeds between 300 to 400 calves annually. I market around 30 calves annually for freezer beef, and I am looking to expand this portion of our farm. My little sister Diana shows cattle and pigs, and also raises show hogs,” said Jennifer Litzeneberger, Mike’s oldest daughter. This farm is truly a family farm, with all members working for the farm. “Myself, my wife Kathy, and my two daughters Jennifer and Diana are involved with our farm. I also have one employee who has worked with me for 22 years. My parents farmed and I started out farming with my dad. It has been a family-owned and operated farm for three generations,” said Mike Litzenberger. Jennifer recently returned to the farm after earning a bachelors of science in animal science with a minor in agricultural resource economics from Colorado State University. “Now that I have finished college I plan to continue working at our family farm, and raising livestock,” she said. “I am extremely grateful and fortunate to have the opportunity to move back into a house on our family farm. I do see myself continuing our family farm and livestock operation, because not only is it something that has been passed down many generations in our family, it is something that I truly have a passion for,” she said. Jennifer Litzenberger truly understands the importance of agriculture, and has a passion to continue to work in the industry. “Agriculture is so important in every single aspect of life, and with only a small portion of farmers left to feed an entire world, we are facing some very real challenges in our future. Prestigious advancements such as GPS systems for tractors, pivot sprinklers for irrigation, and improvements in crop genetics, have given farmers the ability to produce more product off of less land,” she said. “Challenges to farming include the weather, changing markets and continued urban growth around the area,” said Mike Litzenberger. Other challenges that farmers face vary from the type of production, and sugar beet harvest is no exception. “Beet harvest has the main challenges of mud and risk of freezing. There are also more machines involved (one to defoliate first and then one to dig) which is unique part of beet harvest, versus a single harvester for corn and grain crops,” said Mike Litzenberger. The family plans to continue farming, while constantly seeking to improve and expand. “With the use the technology and genetic advancements available today, we hope to raise even higher yielding crops in the future,” said Mike Litzenberger. Even though there are challenges, both Mike and Jennifer are optimistic, and love what they do. “Overall, I love farm life and raising livestock, and I wouldn’t trade it for anything!” said Jennifer Litzenberger. “It’s wonderful lifestyle to raise a family in,” Mike Litzenberger said.